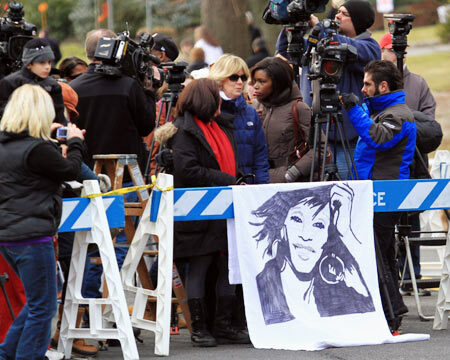 Fans, close friends and family gathered together for Whitney Houston's funeral on Saturday, at the Fairview Cemetery in New Jersey. They spoke about her life and their love for her with much love at the red brick church where she first sang in public, at the age of 11, in the gospel choir alongside her mother Cissy Houston. 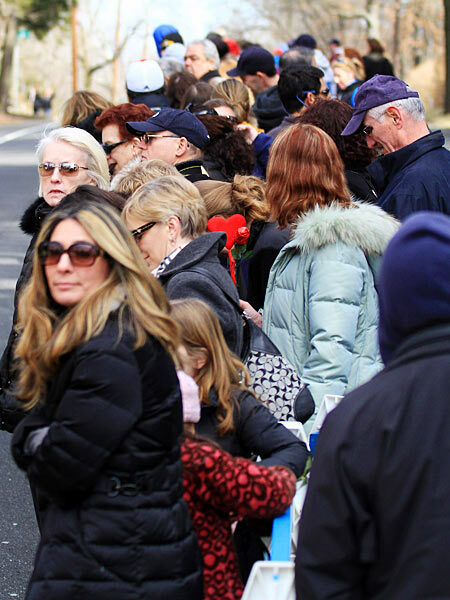 Millions were watching on television, through a single camera in the church. Mariah Carey was there alongside Oprah Winfrey and Queen Latifah. Houston's godmother Aretha Franklin had been due to sing but was too ill even to attend. 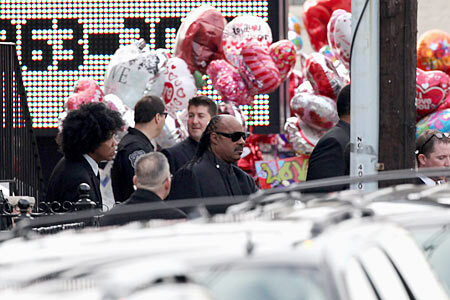 Stevie Wonder sang Love's In Need Of Love Today and revealed his feelings for the late pop diva. 'In my fantasy world, I had a little crush on Whitney, okay?' the Telegraph quoted him as saying. But as the mood swung from celebration to sorrow, it became apparent that this was not a concert, it was an intimate Pentecostal service. The invitations had called it a coming home, and that was true on many levels. Houston's body had been flown home from California, where she was found dead in the bath at the Beverly Hills Hotel on February 12. The coroner has found no signs of foul play, but toxicology reports are expected amid rumours that she died after taking a lethal cocktail of prescription drugs and alcohol. 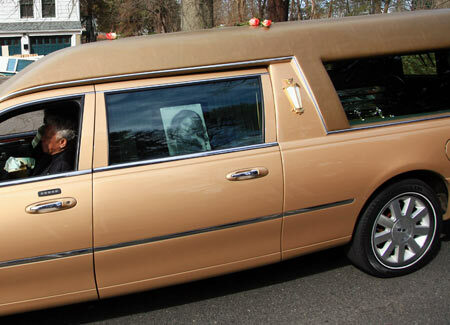 Her body, in a platinum coffin with gold handles, was driven through the streets of Newark in a gold hearse, past the housing projects where she grew up. There had been some debate about whether the singer's ex-husband Bobby Brown was invited, but he arrived late in a limo and wearing dark glasses. He was reported to have walked up to the flower-covered coffin, touched it then left the church again. Their daughter Bobbi Kristina was also there. Kevin Costner, Houston's co-star in her debut movie The Bodyguard gave an emotional address. He revealed that studio executives suggested he should hire someone white to star alongside him, and that he postponed making the film for a year so that she could be in it. He also had to help the singer overcome self-doubt about the part. 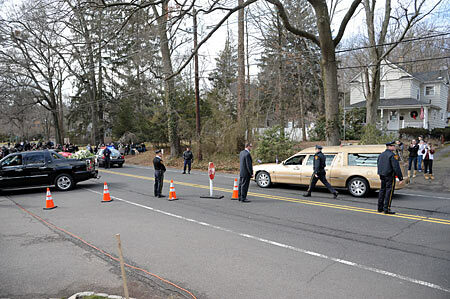 'Off you go Whitney, escorted by an army of angels to your heavenly father. When you sing before him don't you worry, you'll be good enough,' he said. 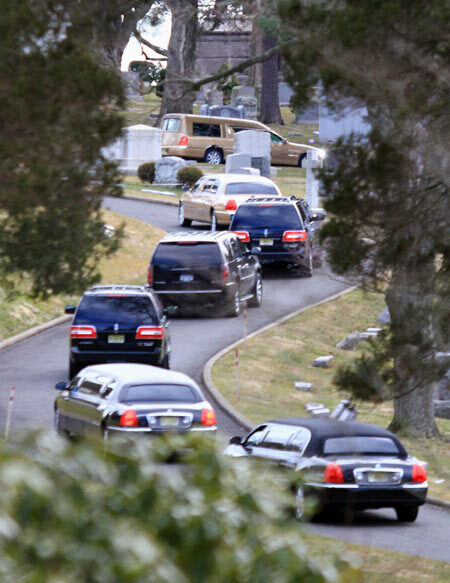 Final Farewell To Whitney Houston!